Say Cheese is a one-to-one interaction between Marcus Fisher, Ashery’s alter ego, and audience/participants. The interaction time was limited to three minutes, during which Marcus facilitated any kind of exchange with participants – confessional, sexual, playful, performative, conversational, psychological – apart from causing or receiving pain. 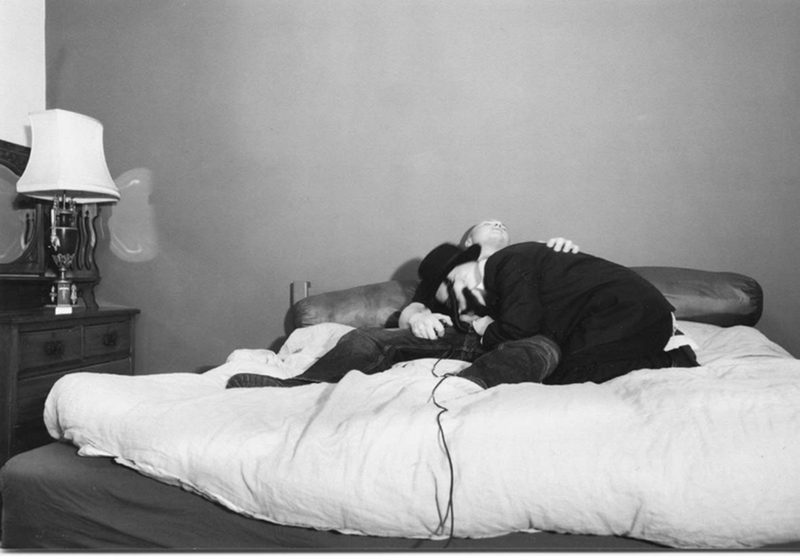 While on the bed, participants were asked to hold a shutter-release cable, which they pressed whenever they wanted. Photographs were sent to the participants a month later. Say Cheese provided an experimental space for constructed intimacies, projections and fictions to take place. Say Cheese was performed in seven cities between 2001-3: In curator Laura Godfrey Isaacs’ bedroom at Salon 17, Home, London, November 2001 / In NBK Gallery curator Wibke Behren’s bedroom, Berlin, January 2002 / In a hotel room, an off-site project curated by Jurij Krpan of Kapelica Gallery, Ljubljana, May 2002 / In a hotel room, an off-site project of the Bluecoat Art Centre at the Liverpool Biennial, curated by the Bluecoat and the Live Art Development Agency, Liverpool, September 2002 / In a constructed bedroom at Arnolfini, part of the In Between Time festival, curated by Helen Cole, Bristol, February 2003 / In a constructed bedroom at the OK Center for Contemporary Art, part of the group show The Promise, The Land, curated by Thomas Edlinger, Stella Rollig and Roland Schöny, Linz, March 2003 / In the bedroom of the curators Michael Gillespie and John Thomson at Foxy Production gallery, part of Ashery’s solo show, New York, July 2003.